Zebra MZ320 - Direct thermal, 203 dpi, 3" width, 3 ips, unlinered platen, 802.11g (Zebra Value Radio) interface. Includes battery and charger unit. Mini Zebra printers take your business where it needs to go! 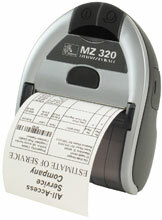 Get the benefits and value associated with Zebra with the MZ 320 economical receipt printer. Each 3" width MZ 320 printer can be a smart assistant for any mobile receipt printing application where you need quick, simple receipts on demand. Use 802.11g, Bluetooth, IrDA or USB to connect to a handheld or smart phone device and produce crisp, clear receipts! Adapter, Cigarette Lighter, Compatible with Zebra MZ Series. 3" x 960" Direct thermal 2.4mil Receipt Paper. Compatible with Mobile Printers. Continuous Roll. Single roll. Does not require a ribbon. 3" x 660" Direct thermal 3.2mil Receipt Paper. Compatible with Mobile Printers. Continuous Roll. Single roll. Does not require a ribbon. Also available as a case (Part# 10011044). The Zebra M3E-0UK00010-00 is also known as ZEB-M3E-0UK00010-00	or M3E0UK0001000	.